let a ray OA revolve in the anti-clockwise direction and assume the position OA1, so that an angle ∠AOA1 = θ is formed. Now any number of points P, Q, R, .......... are taken on OA1, and perpendiculars PX, QY, RZ, ........ are drawn on OA from those points respectively. All the right-angled triangles POX, QOY, ROZ, ......... are similar to each other. 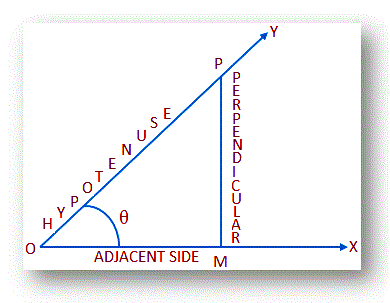 (i) perpendicular : hypotenuse i.e., perpendicular/hypotenuse remains same. (iii) perpendicular : base do not change for the aforesaid similar right-angled triangles. So we can say that the values of these ratios do not depend on the size of triangles or the length of their sides. The values entirely depend on the magnitude of the acute angle θ. It is so because all the triangles are right angled triangles having a common acute angle θ. Similar relations will hold whatever be the measure of the acute angle θ. So we see that in similar right-angled triangles the ratio of any two sides, with reference to a common acute angle, give a definite value. This is the concept on the basis trigonometric ratios. Again we have shown that the ratio of any two sides of a right-angled triangle, have six different ratios. These six ratios are identified by six different names, one for each. 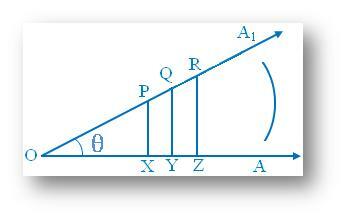 Now we will define trigonometrical ratios of positive acute angles and their relations. Let a revolving line OY rotates about O in the anti-clockwise sense and starting from the initial position OX comes in the final position OY and traces out an angle ∠XOY = θ where ϴ is acute. Take a any point P on OY and draw PM perpendicular to OX. Clearly, POM is a right-angled triangle. With respect to the angle θ we shall call the sides, OP, PM and OM of the ∆POM as the hypotenuse, opposite side is also known as the perpendicular and adjacent side is also known as the base. What are the six trigonometrical ratios? The six ratios sin θ, cos θ, tan θ, csc θ, sec θ and cot θ are called Trigonometrical Ratios of the angle θ. Sometimes there are two other ratios in addition. They are known as Versed sine and Coversed sine. and Coversed sine of angle θ or Coverse θ = 1 - sin θ. (i) Since each trigonometrical ratio is defined as the ratio of two lengths hence each of them is a pure number. (ii) Note that sin θ does not imply sin × θ; in fact, it represents the ratio of perpendicular and hypotenuse with respect to the angle θ of a right-angled triangle. (iii) In a right-angled triangle the side opposite to right-angle is the hypotenuse, the side opposite to given angle θ is the perpendicular and the remaining side is the adjacent side.